DEC IMPIANTI S.p.A. is a private corporation, focused on engineering and supply of turn key sustainable industrial VOC and HAP emission control systems for the flexible packaging, chemical, petrochemical and pharmaceutical industries. Backed with several decades of global experience, thanks to products of the highest quality, patented and/or innovative processes, with thousands of systems in operation, we are facing the global challenges, focusing on innovative technologies and research. 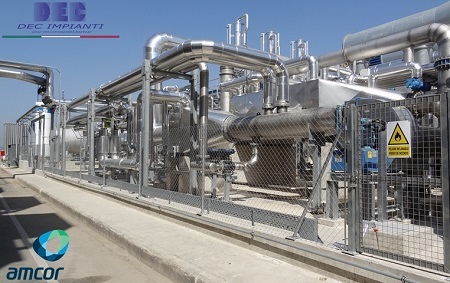 As worldwide market leaders in activated carbon solvent recovery systems, inert gas (nitrogen, N2) regenerated, DEC IMPIANTI has designed, engineered and delivered more units than any other competitor combined. DEC IMPIANTI leads the way in V.O.C. recovery solutions. Our unrivalled technical expertise and experience in sustainable solvent recovery systems make us the world's leading contractor: no other entity has the same breadth and depth of experience or talented inert gas activated carbon solvent recovery engineering resource. This is reflected in our long-term alliances and service agreements with most of the industry's leading companies. We deliver support on the five continents through a distributed local organization, thanks to strategic partnerships, joint-ventures, licensees and agencies, with operations in more than 50 countries.